Update your seating area by adding this End Table, which features a handy drawer for your reading glasses or remotes and a bottom shelf for extra storage or display. 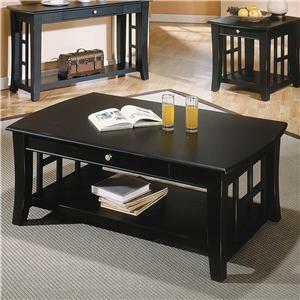 Made of hardwood solids and wood veneers in a sophisticated flat black finish, this simple table has a decorative geometric lattice on the sides for a hint of Asian style. 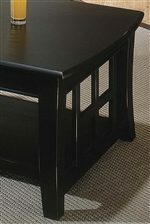 The solid square legs flare out slightly at the bottom, completing the sleek contemporary look. 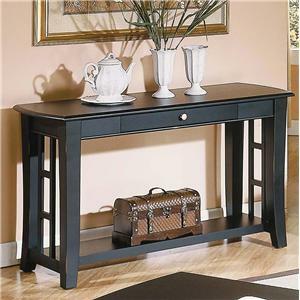 The Cassidy 1 Drawer End Table at Morris Home in the Dayton, Cincinnati, Columbus, Ohio, Northern Kentucky area. Product availability may vary. Contact us for the most current availability on this product. The Cassidy collection is a great option if you are looking for Mission furniture in the Dayton, Cincinnati, Columbus, Ohio, Northern Kentucky area. Browse other items in the Cassidy collection from Morris Home in the Dayton, Cincinnati, Columbus, Ohio, Northern Kentucky area.